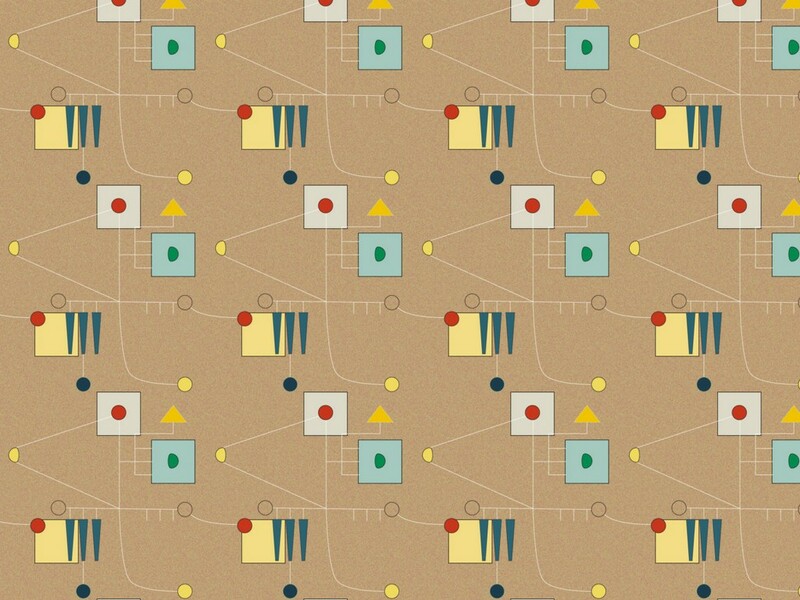 An interesting wallpaper that is designed to look like the wallpapers created in the early to late 1950s or early years of the next decade. 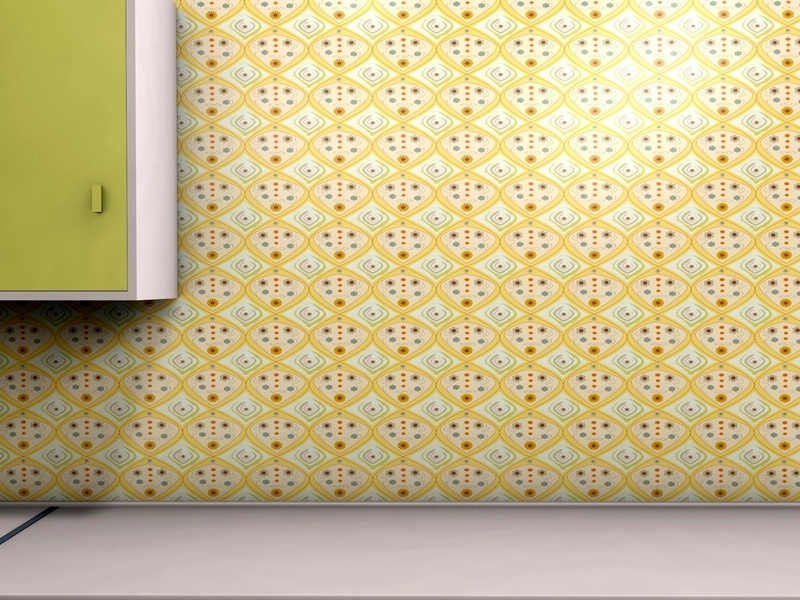 It is shown here as a ‘washable’ kitchen wallpaper using my 1950s kitchen set where it blends nicely with the colours used. 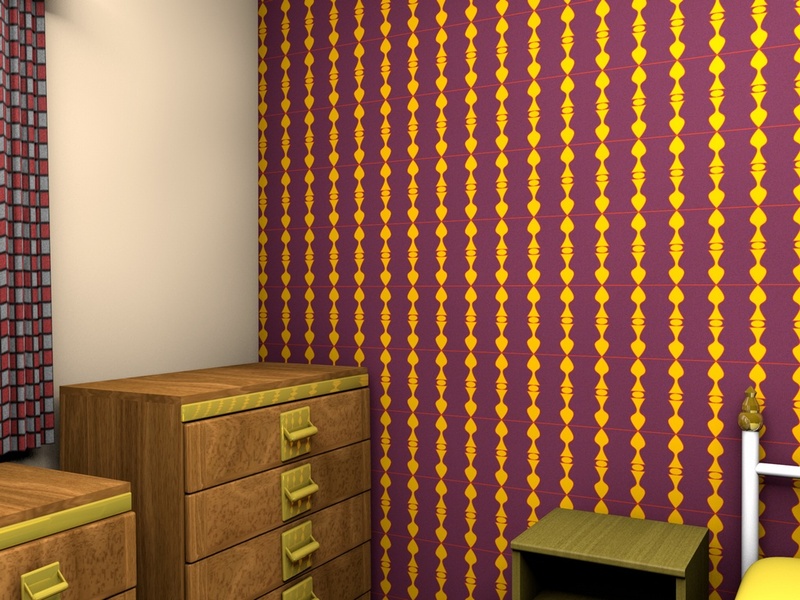 Again, this wallpaper design uses motifs from the 50s along with mid-century colours from the British Standard palette. The design was created in Adobe Illustrator and the final render was created in Cinema 4D and finished using various photo retouch programs. In the 1950s cruise ships were for the super rich but these days it is hard to find someone who has not enjoyed a cruise. The interiors of those ships, then and now, are sumptuous and the experience of a cruise is one well worth having. 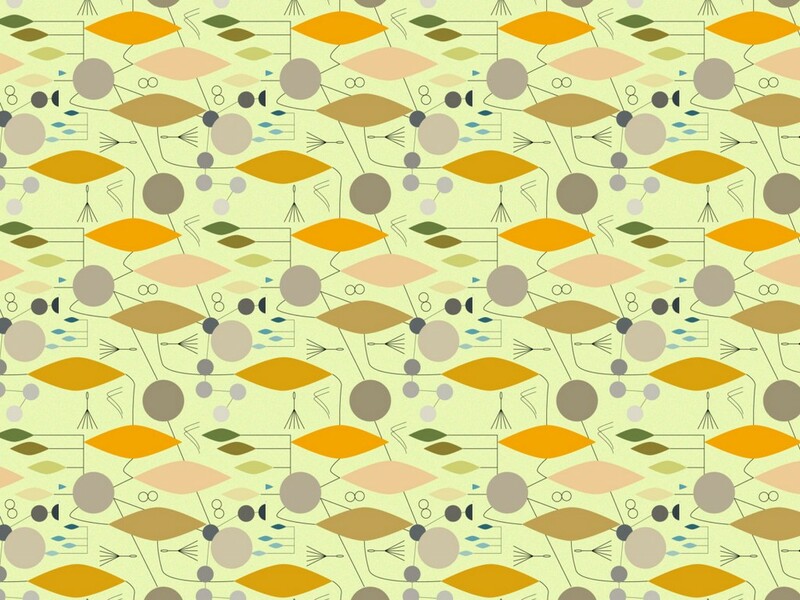 This pattern is one that is designed using 1950s ideas, motifs and designs and I intended it to be a cloth fabric but I wondered how it would look on the modern day cruise ship interior I use for my transport patterns. I was a little apprehensive that a design from that long ago would not go well on a modern interior but I need not have worried. 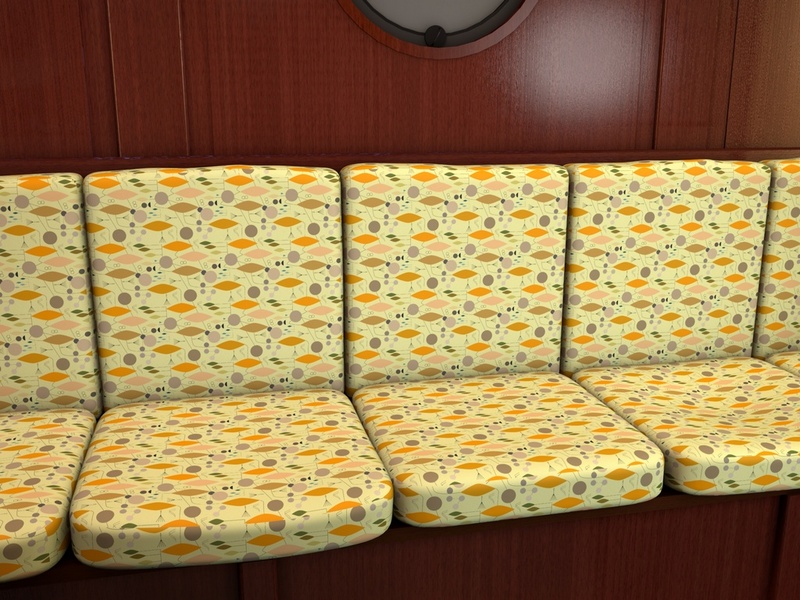 As you can see the fabric design looks perfect and the seating looks suburb in it’s 1950s colours and motifs. Sadly, the fabric would be perhaps too light in colour to be hard wearing enough for a real ship interior but it does show how timeless these 1950s designs are. The design was made with Adobe Illustrator and the ship interior is my own model created in Cinema 4D which was used for the image. 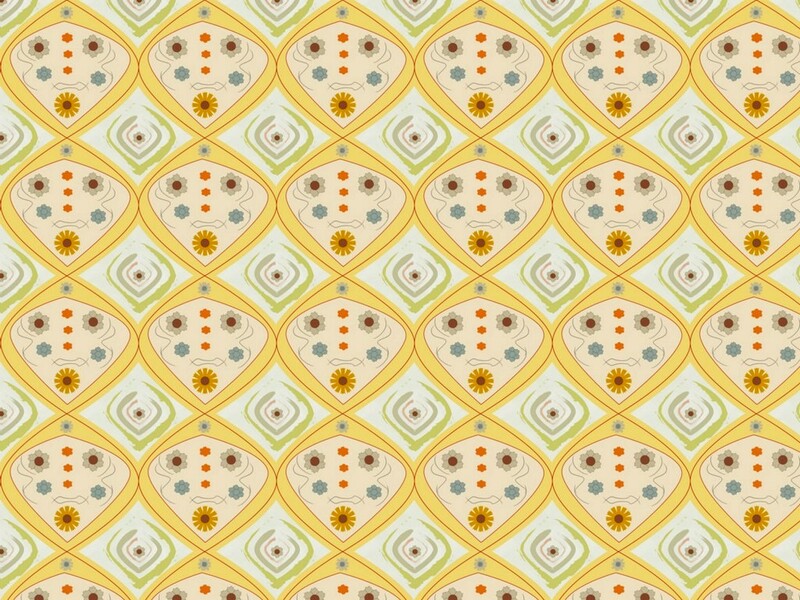 This design closely follows the type of patterns that were created throughout the 1960s although the motif used is far older. The motif is a standard one used for borders and various other decorations for long before the start of the 20th century. 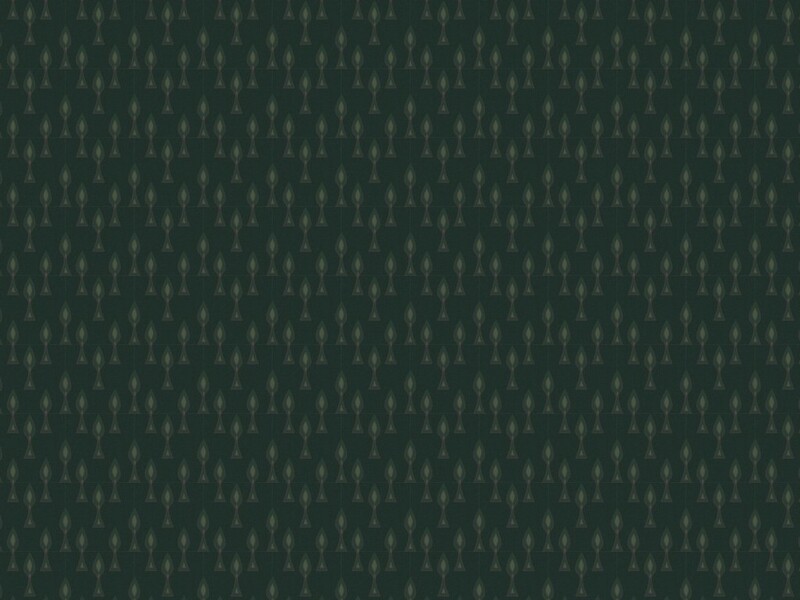 However, it has that ‘mid-century look’ that marks it out as suitable for a 1960s style wall covering. It is shown here in two colours used on two very different rooms. Notice that the living room has the wallpaper on one wall only and the window wall is just a harmonising paint. Even I baulked at the idea of using a wallpaper this strong on all the walls although probably in the 1960s people would not have been so squeamish! 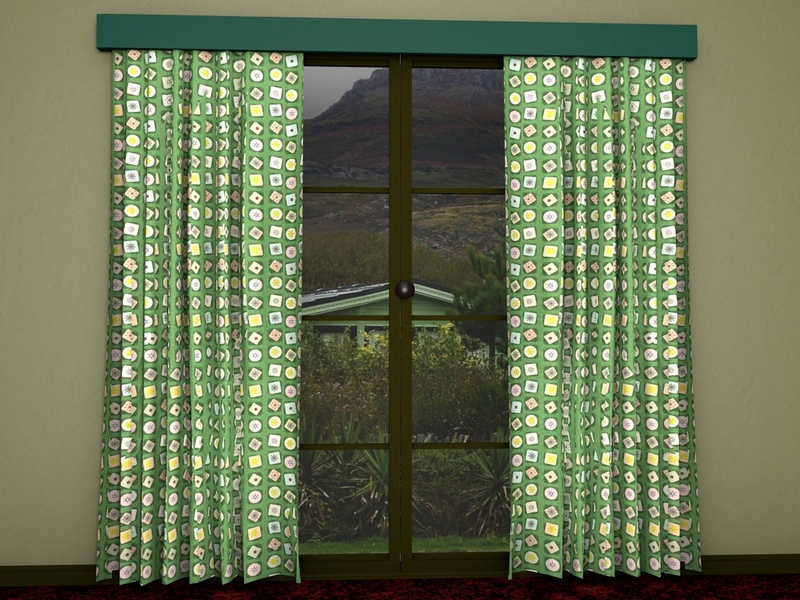 The design was made in Adobe Illustrator while the renders were created in my 1960s style living room and bedroom and tidied up in Photoshop. 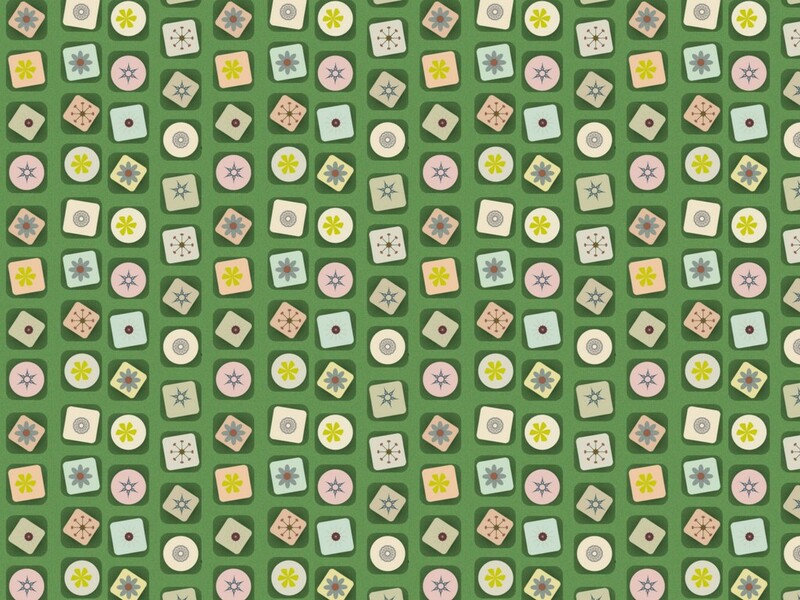 So, here are two versions of the same pattern which are surprisingly effective on two different items of furniture. You will see, if you have seen the previous furnishing patterns, that the sofa that I use has changed for I have got a new one. To be more exact, I have built a new sofa for the major project I am working on – the 1960s house – and I thought that it might look good here. The material is slightly different and the sofa is very different giving a better idea of the way that the fabric would look. Again we have a 1950s pattern but this time it is shown as curtaining fabric as it would have been used in a living room. This is following on from the many designs produced during the early years of the 1950s decade that featured small patterns within some form of frame. The material would have been used for furnishing or, as in this case, for curtaining where at a small scale it enhances the shape of the window and would also enhance the features of the room. The curtaining material design was produced in Adobe Illustrator while the image was created using Cinema 4D and the 3D set used is the standard curtain set that I usually use. I love these 1950s style wallpaper designs when used in a contemporary setting because they give such a period look to a room. This is clearly based on early 1950s designs and motifs and as usual the design is complemented with some classic original colours chosen from the British Standard mid-century palette. The design was made in Adobe Illustrator while the render (you probably know this by now) was created in my 1960s style room and tidied up in Photoshop. 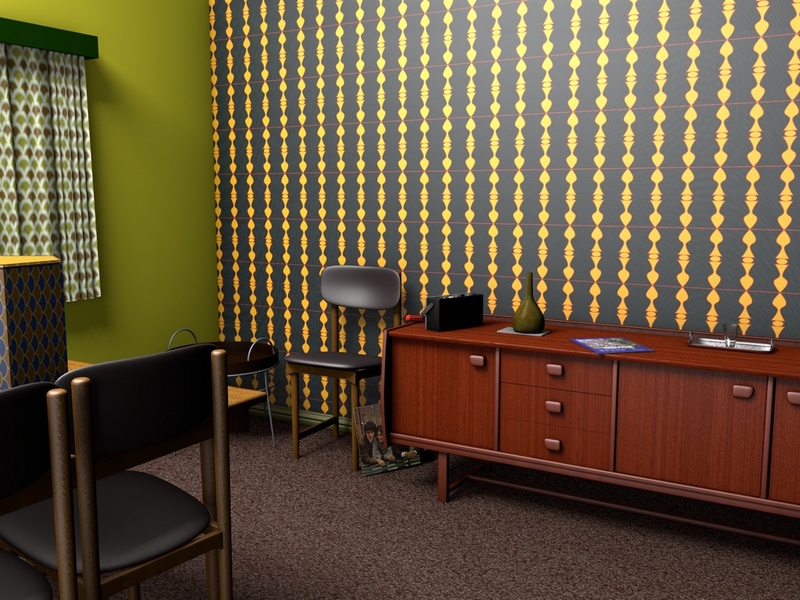 A riotous wallpaper design made with the later 1960 in mind which uses contemporary shapes and colours to produce a good interpretation of the look of a mid-century UK living room. Wallpaper designs were colourful and, to our taste, perhaps bizarre and, even worse you would say, they were on all the walls rather on a feature wall and toned down by more sober colours on the remaining walls. 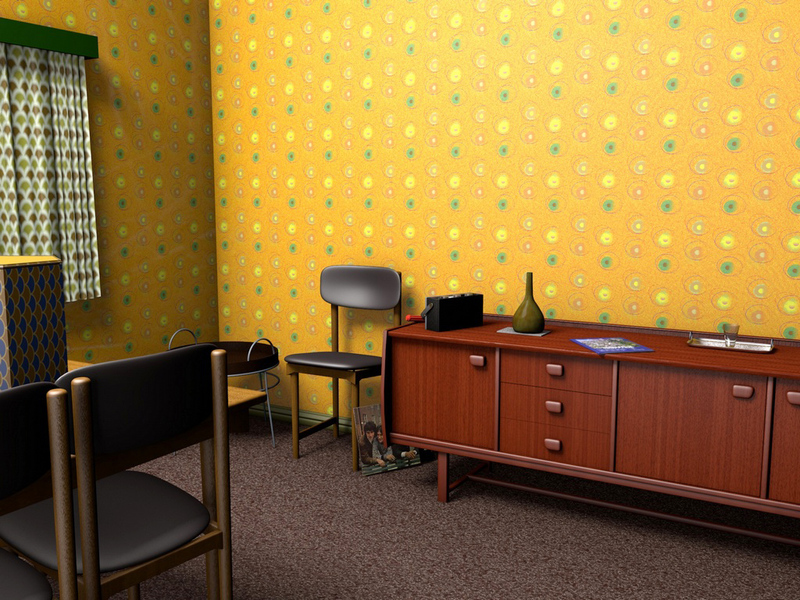 Having finished this design and applied it as a texture to my period living room set I was pleased to see how the final effect mirrored my recollections of that late 60s period. Rooms really did like like this! 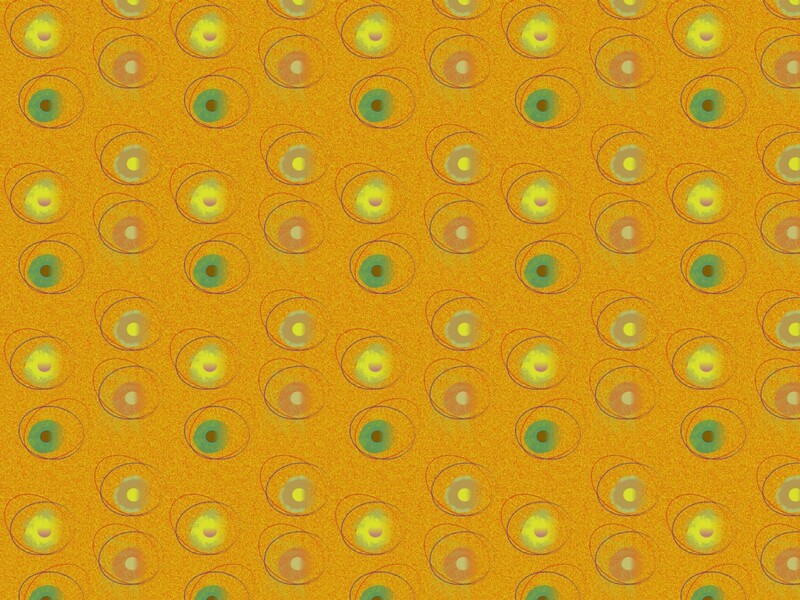 The design was made in DrawPlus 8 (which I presently trialling and which, if you using software to draw, is worth a look). 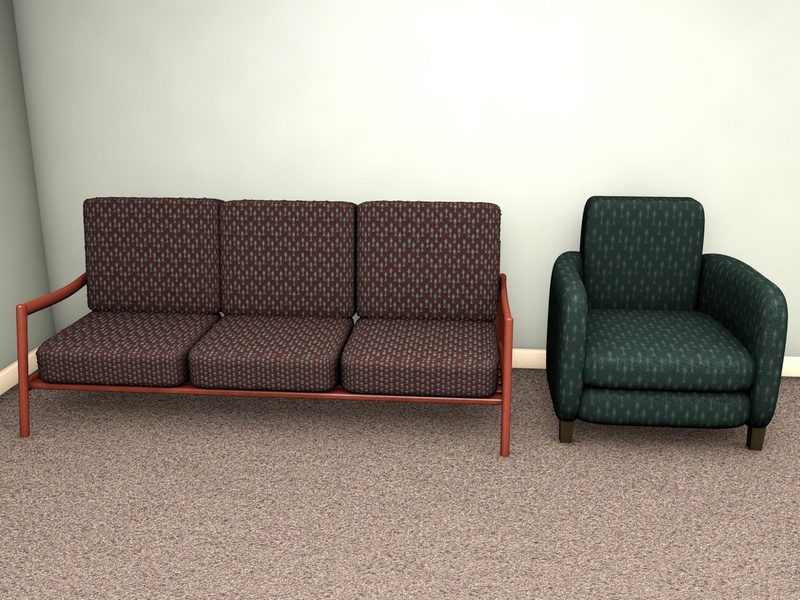 The final render was created in Cinema 4D with my living room set.